Title: The Womanly Art of Breastfeeding, 7th ed. Author: La Leche League, Intl. Short summary: A breastfeeding resource for mothers about the benefit of human milk for your baby, how to prepare for breastfeeding, tips on how to combine breastfeeding and working outside the house, finding time for yourself while meeting your baby's needs, and suggestions on overcoming some of the most common problems that may arise. What I thought: This book would be a good starting point for someone just starting to learn more about breastfeeding. It is written by La Leche League, a breastfeeding activist group, and they do state that breast is best, a position I happen to support. But, so does the American Academy of Pediatrics, the World Health Organization, U.S. Dept of Health and Human Services, and countless health professionals and medical studies. I appreciated the fact that the book did not use any scare-mongering tactics that seem to crop up in this debate; they do acknowledge it is a decision each woman needs to make for herself. I actually found this book almost more helpful than the few LLL meetings I have attended, which have a very low attendance record where I live. I also really liked the chapter on Discipline as Loving Guidance. I was not expecting a chapter on discipline in a BF book, and they offered some very valuable and practical advice. There is a great list of further resources at the end of the book. The major downside to the book is in the layout. I am looking for a resource that I can easily refer to if any problems arise with breastfeeding. This book has some of that information, but not in a format that would be easy to find at say...3am with a hungry baby and a very sleepy mum. For that, the resource that looks the best is Dr. Jack Newman's online breastfeeding resource, which was referred to me by my doula. Overall, I would recommend this book to all pregnant mothers, and especially those who, like me, have already decided on breastfeeding for at least the first year of their little one's life. Here are some chocolate-y treats just for you! First sentence: Virginia Woolf is an icon with a shaky reputation. Short Summary: A Life of One's Own tours Virginia Woolf's life and writing, gleaning insights into such topics as friendship, career, love, and knowing yourself. Is this a challenge book? No, this is a review book I received from the author. What did I think? I was drawn to this book more for the insight into Virginia Woolf's life rather than the fact that it appears to be marketed as a self-help book. With such chapter headings as Accept Solitude, Take on Challenging Friendships, and Make Use of Time, I wasn't too sure what to expect. What I found was a collection of thoughts that stirred my psychology roots, and a gem of humble insights into Virginia Woolf's life. Humble, because Ilana Simons admits "You should know that in my own book here, for instance, I'm misreading Woolf on a million points, but because she's not here to correct me, and because my misreadings create a Woolf that's almost my double, my love for her feels vaulted and perfect." (p.178) Through no fault of its own, I did not particularly enjoy the parts that catered to applying the self-help tidbits to your own life. However, this is a wonderful book for any Virginia Woolf fan, and incorporates an intriguing blend of psychology and literature. Completely unrelated to the quality of the book, I have to acknowledge the beautiful cover art. When it arrived in the mail I was delighted by the beauty of the book, something I can not say very often. Penguin books never seem to let me down in terms of aesthetics! It is also the perfect lead-up to the current book I am reading, my second Virginia Woolf novel, To the Lighthouse. I'm tired, crampy, achy, and bored. So what else to do on a Sunday morning to cheer me up but go to the Baltimore Book Thing? For those who may not remember, or are relatively new to my blog, The Book Thing is a nonprofit organization that collects any and all used books to give out to schools, libraries, shelters, prisons, soldiers in Iraq, basically anyone and anywhere that needs a book. On the weekend, they open their warehouse to the general public and you can go browse around and take as many books as you want. For free. To keep. It is my favorite place in Baltimore. 1. Stones from the River - Ursula Hegi. I recently read a review of one of her books on another blog. Who was that? I can't seem to find it again! 2. The Tin Can Tree - Anne Tyler. Anne Tyler books are in large supply here, her hometown. I have found quite a few of her books at The Book Thing. 3. Anil's Ghost - Michael Ondaatje. Not his most well known novel, but this story takes place in Sri Lanka, Ondaatje's country of birth, and sounds intriguing. 4. The Brothers K by David James Duncan. Although this copy is slightly beat up, I was very excited to find it, I've been meaning to read this book for years. 5. The Corrections by Jonathan Franzen. I know this book has a lot of hype, which I have largely ignored. I can't wait to judge it for myself. 6. The Testament by Elie Wiesel. I love his non-fiction writing, so it was a joy to find one of his novels. 7. Paddy Clarke Ha Ha Ha by Roddy Doyle. One of my favorite finds for today, I can't wait to delve into this Booker prize winning novel, in my slow but steady effort to read all of the Booker winners. 8. An Academic Question by Barbara Pym. I am acquiring quite a few Barbara Pym books, this is my sixth. They are all gems. 9. Best American Essays edited by Susan Sontag. This 1992 edition includes essays by Joan Didion, E.L. Doctorow, Jamaica Kincaid, John Updike, and Gore Vidal. 10. The Best Known Works of Henrik Ibsen. This one was published in 1928. 1. Rebecca by Daphne du Murier. I have been waiting to acquire my own copy for quite a while. Maybe now I will actually get around to reading it. 2. The Tempest by Shakespeare. Another Shakespeare to add to the collection. 3. The Constant Gardener - John Le Carre. I have never read anything by Le Carre, but I really enjoyed this movie. 4. Eva Luna by Isabel Allende. Another Allende for the collection, this is one of the few I haven't read. 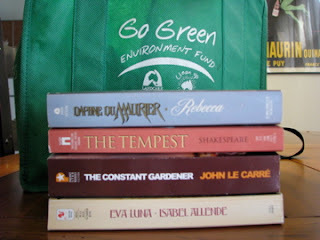 Book Nut's Expanding Horizons challenge fits in perfectly with my Reading Across Borders long-term challenge. Here is a preliminary list of books I would like to read for the challenge. I'll probably narrow down my choices closer to January. For the longest time, I have been wracking my brain to remember what I had read by Lois Lowry as a child. 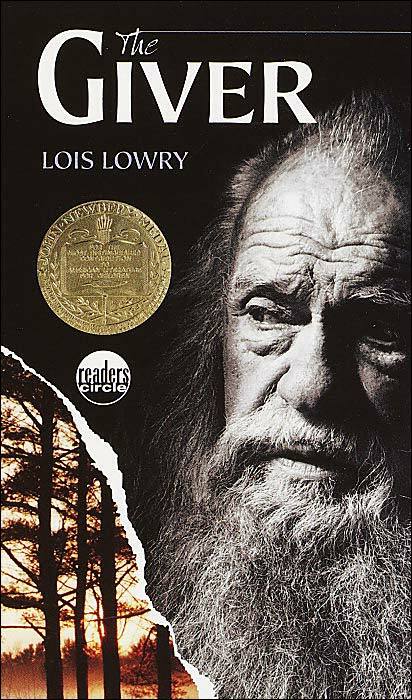 The Giver was published in 1993, when I was 14, when I had moved on to adult novels. I definitely would not have been caught reading a "children's" book during those early teen years. Same goes with Number the Stars (I was 11 when it was published, but never read it). Finally, I stumbled across her website, and looked at her book list. Before the Newbery awards, National Jewish Book Award, Sidney Taylor Award, and a gazillion other awards and recognitions, there was Anastasia Krupnik. I had completely forgotten about this delightful series that came out in the 1980's, and I am delighted to recall one of my childhood favorites from the realm of foggy memories. Yay! Can you tell how excited I am? Ok, now that that's out of my system (stay tuned for future re-reads of the Anastasia series), I can move on to my review of The Giver. First sentence: It was almost December, and Jonas was beginning to be frightened. Short Summary: Jonas lives in a world where everything is perfect and under control. When Jonas is twelve, he is singled out in his community to receive special training from the Receiver of Memories. The Receiver is the only person in the whole community that holds the memories of true pleasure and pain. Now it is Jonas' turn. Was this a challenge book? I read this book for the BookAwards Challenge. It is the 1993 winner of the Newbery Award. The Giver is a though-provoking book for people of all ages. It is interesting to think about what it would be like to live in a community like Jonas': never experiencing pain, to always be content, yet having no knowledge that life could be any different. 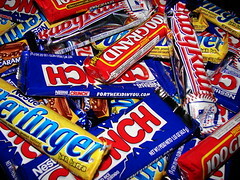 A life where you have no chocie, everything is assigned to you, including your career, spouse, and children. Where there is no true concept of feelings (or colors!). I particularly like that the ending is left ambiguous. It certainly gives the reader a lot to think about. "Many kids want a more specific ending to The Giver. Some write, or ask me when they see me, to spell it out exactly. And I don't do that. And the reason is because The Giver is many things to many different people. People bring to it their own complicated sense of beliefs and hopes and dreams and fears and all of that. So I don't want to put my own feelings into it, my own beliefs, and ruin that for people who create their own endings in their minds." First sentence: I suppose because I went to film school, I think of my story as a sort of film. Short summary: Isabel Walker travels to Paris to help her sister Roxy during her second pregnancy. When Roxy's french husband leaves her for a Czechoslovakian sociologist, Isabel is there to help pick up the pieces. It is a story of one girl's naivete (Isabel), as well as a larger look of American ex-pat life in Paris. Is this for a challenge? Not really, although it does fit into the Book to Movies challenge. What I thought: This book is fairly good. It was definitely a lighter read, but that's just what I needed. Diane Johnson is a gifted writer. I did not like any of the characters, with the exception of the delightful Mrs Pace, but I don't need to like the characters to enjoy a story. I have never visited France, but I felt as if she exaggerated the stereotypes and cliches, although this could have been done on purpose. The whole novel struck me as slightly comical, poking fun at both American and French idiosyncrasies. The only major drawback was the loose threads of some of the plot lines at the end. I thought there would be a sequel, but there isn't one. I would like to know more about the files of Mrs Pace! I started this year with a somewhat small challenge, to read one book by an author from another country each month. I decided to expand that, however, to aim for the *slightly* larger long-term goal of reading a book from every country. I am fairly happy with my progress, although I feel some books don't count completely (my choices from Afghanistan, Cuba, China and Cambodia), and I would like to read some works in translation from these countries in the future. In the coming year, I would like to focus on Eastern Europe, the Middle East, and Africa. Australia: Illywhacker, The True History of the Kelly Gang by Peter Carey; Dirt Music, Cloudstreet and Blueback: A Fable for all Ages by Tim Winton; Zig Zag Street and Bachelor Kisses by Nick Earls. First of all, I just want to draw attention to the absolutely amazing job that Dewey at the hidden side of a leaf did in organizing the 24 Read-a-thon this weekend. With so many participants, and challenges going on, she did a perfect job of keeping everything together without a glitch. Great job, Dewey!!!!!! One of the best things about the read-a-thon, is that I got to know some bloggers a little bit better, and met a whole lot of new-to-me ones! This is what made participating so much fun. It was also pretty cool to win one of the mini-challenges, especially one of the two I participated in when I woke back up in the middle of the night! I cheered on and off the whole day, I don't profess to staying up the whole night! Based on the updates I read in Readers' blogs, YA fiction and other shorter, easier to read books were a big hit. Newbery award winners were quite popular. I think graphic novels would also be good entertainment for the wee hours. Nope, not really. I thought things went very smoothly! Everything! I also think Dewey created a great atmosphere for building comraderie between all participants. I found it a lot of fun to stick around for large parts of the day, rather than only 'cheer' for one hour. From reader feedback, even a little comment can go along away in the middle of the read-a-thon. I hope to participate again next year, as a reader this time. This Cuppa is just for you!!!!! Enjoy, and keep up the great work! Since my hubby actually has a rare whole weekend off, I decided not to be a reader in Dewey's 24 hr Read-a-Thon. But I will be in and out for the next 24 hrs cheering everyone on (including during my middle of the night pee breaks!). Good luck to all the readers! And most of all, Have FUN!!! Update 6.00am EST: I have not been able to go back to sleep. Just had breakfast, which might help. But it might be a lost cause. 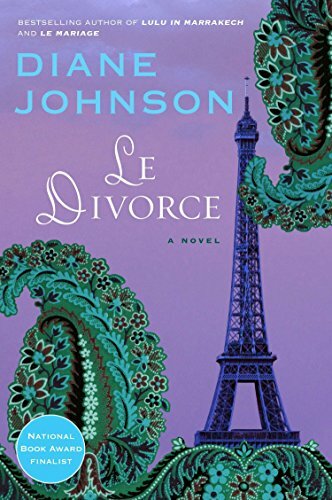 I'm not officially a reader in the 'thon, but I'll still do a haiku about Isabel, in Le Divorce by Diane Johnson, the mini-challenge for Hour 21. That is the best I can do on so early a morn. Debi is back from her nap. Go Debi!! Callista just wrote a wonderful haiku about Jonah in the Giver, by Lois Lowry. 3m is reading Tears of a Giraffe, a great light read for the wee hours of the morning. L-Squared just finished Tuesdays with Morrie. She's finished 4 books!!! Dewey is still going strong! I can't seem to find the post that has her reading updates (hey, it is pretty early here), but she is faithfully updating her blog every hour! Way to go girl!!! Eva posted an extremely helpful post with all the still active readers. She has finished 2 books, including one by Anton Chekhov. Becky has finished another book, A Crooked Kind of Perfect by Linda Urban. Way to go! Update 9.10pm EST: Here are my responses to Dewey's mid-event survey. 1. What are you reading right now? I'm not participating as a reader, but I just started Le Divorce by Diane Johnson. 2. How many books have you read so far? Can I plead the 5th? But I've cheered myself hoarse! 3. What book are you most looking forward to for the second half of the Read-a-thon? Not a book, but looking forward to reading updates on other people's blogs! 4. Did you have to make any special arrangements to free up your whole day? I'm just stopping in and cheering every few hours when I have some time. No special arrangements. 5. Have you had many interruptions? How did you deal with those? Well, when I was going through commenting on all the reader's blogs earlier, my hubby was trying to get me outside to install the baby's car seat in our car. I really should have taken advantage of his motivation! And fortunately, he patiently waited until I was ready. 6. What surprises you most about the Read-a-thon, so far? The number of participants, and how much they are accomplishing, it's great! 7. Do you have any suggestions for how to improve the Read-a-thon next year? Maybe setting up a new blog just for that purpose? 8. What would you do differently, as a Reader or a Cheerleader, if you were to do this again next year? I would like to host a mini-challenge next time, and participate as a reader. 9. Are you getting tired yet? Nope. But I just came out of a nice, warm bath, so that might change soon. 10. Do you have any tips for other Readers or Cheerleaders, something you think is working well for you that others may not have discovered? People seemed to appreciate the virtual cup of tea I left on my blog for readers! Jessica: Jessica is getting started on Norwegian Wood, by Haruki Murakami. A great author choice, I wish her the best of luck! Alison: She is delving into the world of YA fiction, continuing with Scott Westerfield's Uglies trilogy that she started a few weeks ago. Keep up the great work! 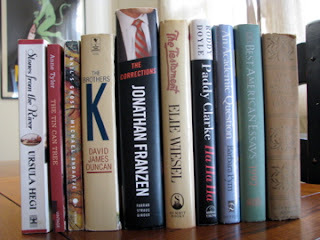 Deb: Deb is currently reading The Book of Vice: Naughty Things (And How to Do Them). What an intriguing choice! The readers are doing a wonderful job!! And Dewey, all I can say is, you are amazing! God is Dead - Ron Currie, Jr.
First sentence: Disguised as a young Dinka woman, God came at dusk to a refugee camp in the North Darfur region of Sudan. Short Summary: A wounded Dinka woman arrives at a refugee camp, looking for her lost brother. It turns out the woman is God in human form, and when she is killed, news spreads around the world about God's demise. What follows is a series of short vignettes, some with overlapping characters, of what happens in the years that follow. What did I think: If you swallow the fantastical fact in the first chapter of this novel (God's death), you are in for an unbelievable ride into what could happen when the whole world simultaneously experiences a spiritual vacuum. The societal changes that occur are an echo of things already happening in our world today, taken to the extreme. This satire is also infused with a subtle humor that brings the whole story up a notch: a street-talking Colin Powell that actually stands up to the Bush Administration, feral dogs who feasted on God's human body suddenly becoming philosophical and speaking numerous foreign languages. It is not a story for its religious message, as some may think, but an insightful commentary on certain aspects of our culture that already exist (as the quote I chose above hints at this thought). It is a wonderful piece of debut fiction. What I didn't like: I feel that I did not catch all of the connections between the characters. Sometimes I felt that someone was introduced that I might have met before at another stage in their life, but I wasn't sure. Another re-reading may help work this one out, and I believe it is a book that lends itself well to multiple readings. I meant to post my review today of God Is Dead by Ron Currie, Jr., especially since I will most likely finish my current read today, Balzac and the Little Chinese Seamstress by Dai Sijie. But they will both have to wait. In replacement is some Friday fun. I was almost caught up on my book reviews too! 1. October is unseasonably warm this year. 2. 200+ books on my TBR pile doesn't/don't scare me! 3. Haunted houses would not be fun to live in. 4. My favorite scary movie is The Shining because Jack Nicholson rocks--and sometimes scares the hell outta me. 6. It was a dark and stormy night tonight. 7. And as for the weekend, tonight I'm looking forward to curling up with a good book and a cup of tea or hot cider as the thunderstorms rage, tomorrow my plans include going on a long walk with my hubby and catching up on laundry and Sunday, I want to go buy the remaining things we need for the baby's nursery! Maggie recently posted a powerful and moving interview with Ishmael Beah, a former child soldier and author of A Long Way Gone. I've mooched it from her. Rehabilitating and repatriating child soldiers is a long, difficult process for everyone involved. The viciousness of the type of recent armed conflict that exists in Sierra Leone, Liberia and other parts of West Africa (as well as Burma, Democratic Republic of the Congo, and Sri Lanka) is something few of us have witnessed, and therefore is little understood by the Western world. Many people don't realize that child soldiers are drugged and have their lives threatened in the indoctrination into rebel groups. Many children forcefully recruited are orphaned, others kidnapped from their families. I am sure it took a lot of courage for Ishmael Beah to publish a book about his experiences, and it is heartwarming and empowering to see that he was able to move on from that part of his life and now works to raise awareness of the atrocities that occurred in Sierra Leone and other parts of West Africa. I look forward to reading this book in the near future. First sentence: Some years ago there was in the city of York a society of magicians. What I thought: Other than the fact that it was hard to read this book with a belly the size of a basketball, I really enjoyed it. :) It took me two weeks to finish the book, but that is not a sign of weakness. I have heard many people refer to JS&MR as an "adult Harry Potter". I believe that does a disservice to both this novel and the Harry Potter series. Yes, it involves magicians in the UK, but that is where the similarities end. 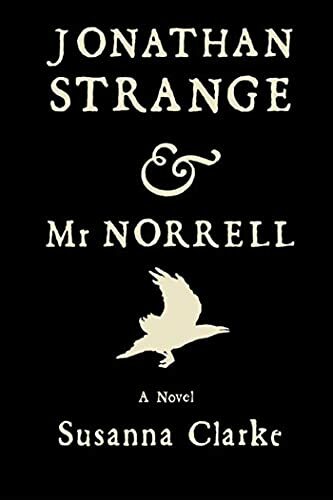 What makes this story unique is the foray into magical theory and a fantastical history of England. Large portions of the book are occupied with debate over the history of magic in England, and how it should be brought back. Don't let this description turn you off, it's a very hard book to describe, but well worth the time it takes to read it. It does become a bit murky in the middle, but last 200 pages really pick up the pace! Update: Check out the wonderful review of this book by Dewey at Hidden Side of A Leaf, who felt the same way about JS&MN as I do. First sentence: Mariam was five years old the first time she heard the word harami. What I thought: It's difficult to follow a first novel with the acclaim that The Kite Runner has, which happens to be one of my favorite books. For the most part, A Thousand Splendid Suns stands on its own. It is a powerful story of two generations of women living in Afghanistan over the span of three decades. Their stories are intricately woven with the modern history of Afghanistan. I really enjoyed reading this novel, but did feel at times as if this history became the main character of the story, rather than Mariam and Laila. I have been MIA for a while, and my blog posts will more than likely become less frequent in the coming months. I still plan on doing book reviews, but they will be noticeably shorter. But, I'm still here, and things are still going well! Just starting my 35th week, I have just over one more month till my due date! Other than frequent back aches, which refrain me from sitting in front of a computer for long periods, things couldn't be going more splendidly. The nursery is basically complete (even though she won't be sleeping there for a while, since we are co-sleeping the first few months), and the car seat will be installed sometime this week. I have a drawer full of baby clothes---and a huge storage container of other sizes in the closet. I can't believe we are almost ready for the BIG EVENT!! And, I thought I would share a few belly photos. Enjoy! First sentence: Mums know everything. I received this book in the mail a few weeks ago, after being one of the lucky prize winners of a book giveaway over at ReadySteadyBlog. Thanks to a generous donation by The Book Depository, I am now a proud owner of this little gem, that is currently unavailable here in America. Mum Stuff is an upbeat, comprehensive guide of activities for children. I'm delighted to find some of my childhood favorites that seem to have been forgotten: making exploding volcanoes, tie-dying, and blind man's bluff. There is a wonderful chapter on how to throw a kid's birthday party, and lots of ideas for different themes and how to make costumes out of things around the house. And, I have found lots of ideas I would never have thought of: 12 things to do with a pair of tights, telling your fortune with apple seeds (pips), and a whole chapter on old wives' tales and where they originated from (carrots improve your eyesight, dandelions make you wet the bed). My only complaint about the book is that the activities are not arranged by age. For the first-time mum (i.e. ME!! ), you could spend a while searching the book wondering when you will be able to use these ideas. However, most things seem adaptable to kids pre-school age through 2nd or 3rd grade (this is my completely child-illiterate guess!). Hopefully I will remember I have this book on my bookshelf in the future, when our currently un-born child is a little older!